Check out and download the Exclusive Valentines Party Flyer PSD Template Freebie. If You need a good flyer design for your events to attract people to your club, bar and pub then this Valentines Party Flyer PSD Template Freebie design is perfect for your next Valentines party and club event. Valentine’s Day is an opportunity for every entertainment venue in the World to draw in customers, whether you’re promoting events or organising Valentines party. The Valentines Party Flyer PSD Template Freebie help you create effective and impactful Valentine’s Day Event marketing, quickly and easily. Promote your next Valentines Party event with this amazing Valentines Party Flyer PSD Template Freebie design for Photoshop! This Valentines Party Flyer PSD Template Freebie is very easy to edit, change the color, text, shapes or other elements that you can easy add/delete according to your personal choice. The header of the design is filled by Heart Graphic. This Heart shape replaces the need for stock images yet giving elegant look to this Valentines Party Flyer PSD. Valentines Party Flyer is without model, but in case you want to add any model picture, you can replace with your own image. Whether you’re looking to produce a Valentines Party Flyer for a nightclub, or an invitation for a restaurant, we’re sure this flexible and easy-to-use template is a prefect choice of flyer design. This print ready premium flyer template includes a 300 dpi print ready CMYK file and Very Well Organized. This freebie is ready to print with 2 color variation Dark and Light. All main elements are editable and customizable. You can edit the main text via text tool, the model image you can replace via smart object, right click edit smart object in your layer menu. The flyer is fully layered and organized to keep customization very simple! The multiple layers of title text and editable text sections gives you complete control over how much information you include in your Valentines Party Flyer design. Easily insert dates, times, entry prices, directions and more. You are also granted an Unlimited Use and 100% Royalty Free License meaning you can use this Valentines Party Flyer PSD Template Freebie as many times as you wish for as many clients as you wish. You are free to use this Valentines Party Flyer PSD Template in both personal and commercial work. If you use this awesome free flyer template kindly give some credit to DownloadFlyers.com as well. 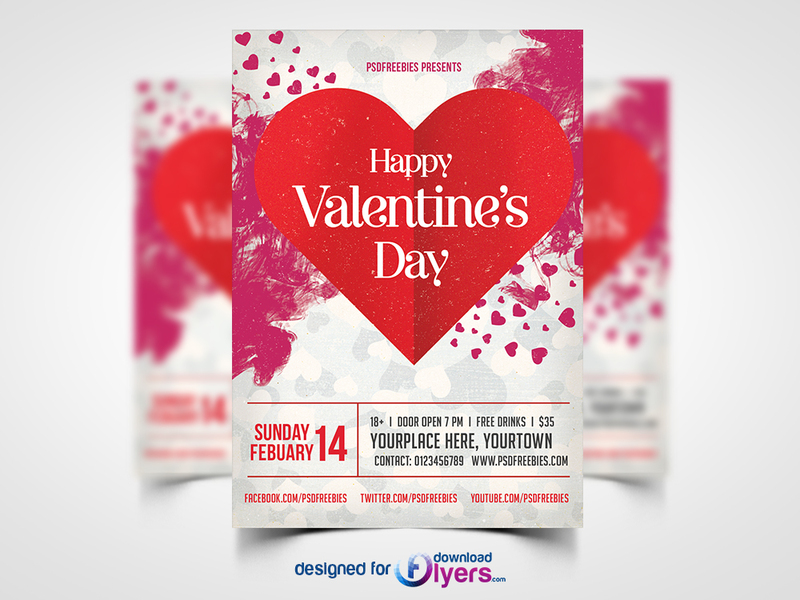 So Download this print-ready and well-organized Valentines Party Flyer PSD Template file and use it as you like. Hope you like it. Enjoy!